For almost a decade Tom Petty has been one of the best known figures in rock 'n' roll but his popularity has reached a all-time high with his involvement in supergroup The Traveling Wilburys. The Wilburys' album which featured Petty, along with Roy Orbison, Bob Dylan, Jeff Lynne, and George Harrison, has sold enormously well, and now Petty has released his first solo album, Full Moon Fever. The majority of Full Moon Fever was recorded before the Wilburys' project but put on hold while that album was completed. The album was produced by Jeff Lynne, Petty and Heartbreaker Mike Campbell. Petty's solo album and the Wilburys' project both stem from the time when Petty met Lynne backstage at the 1987 Dylan/Tom Petty and the Heartbreakers show at Wembley Stadium in England. "We talked for a few nights, and then he gave me that Cloud Nine album of George's," Petty said. "I came home and listened to it and I just loved it. I loved the sound of it, and I thought it was a very crafty record, very creative." Petty and Lynne met later in Los Angeles and started writing some of the songs that would eventually make up Full Moon Fever. Full Moon Fever sounds like a very Los Angeles-influenced record. Petty, a southern boy, has lived there for many years but after his house burnt down he's moved around, living in various neighbourhoods, and claims it has given him a different perspective on the city. "There's just so many sides of life in this town," he said. "I have become infatuated with it and I really love it in Los Angeles all of a sudden." Talking of the Wilburys, Petty admitted, not surprisingly, that the death of Roy Orbison came as a complete shock to them. "None of us were prepared for that," he said. "But I've come to accept it, you know? I miss Roy. I think he'll be remembered forever and I think Roy is probably all right wherever he is." Petty doesn't seem to confident that there'll be a Wilburys volume two album. While not out of the question, it's not a project that's being considered at present. "It's a miracle that we did one," he laughed. "Somewhere down the road we might do another one. "The thing about the Wilburys is that it happened so casually, and I for one am a little sceptical of saying, 'okay, let's do it again' because it would have to be a little more formal, given the circumstances and all the success it's had. "I would do it again if everybody else wanted to but I don't want it to become too formal, because that wasn't the spirit of the thing -- and, of course, Roy being gone it would be a different thing too." When Del Shannon was in Australia, there were rumours that he would replace Orbison as the next Wilbury. 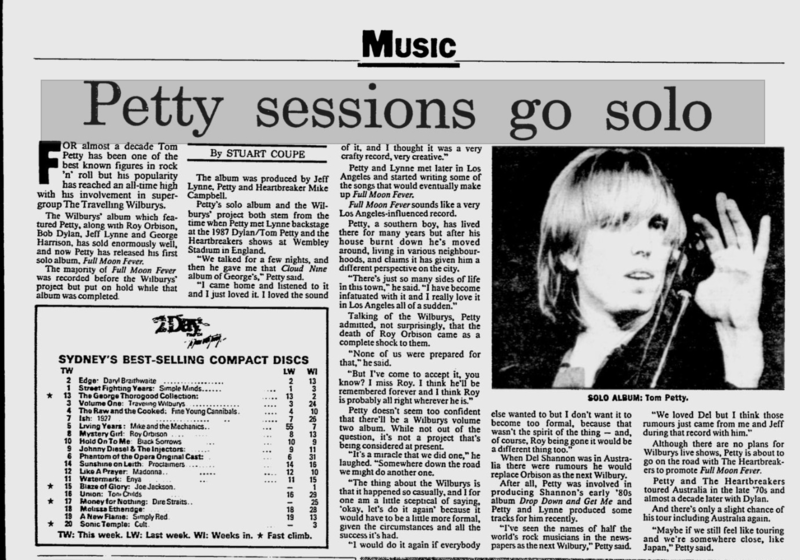 After all, Petty was involved in producing Shannon's early '80s album Drop Down and Get Me and Petty and Lynne produced some tracks for his recently. "I've seen the names of half the world's rock musicians in the newspapers as the next Wilbury," Petty said. "We loved Del but I think those rumours just came from me and Jeff during that record with him." Although there are no plans for Wilburys live shows, Petty is about to go on the road with The Heartbreakers to promote Full Moon Fever. Petty and The Heartbreakers toured Australia in the late '70s and almost a decade later with Dylan. And there's only a slight chance of his tour including Australia again. "Maybe if we still feel like touring and we're somewhere close, like Japan," Petty said.